The Ohio State Buckeyes have unveiled their Nike LeBron Soldier 11 Cleats that their players will be wearing for Saturday’s home opener against Oklahoma. This cleated-version of the Nike LeBron Soldier 11 comes dressed in the schools Scarlet Red and White color scheme that also features logos on the cross-straps and pull-tabs. Finishing off the design is a Metallic Red cleat plate. Check out the additional photos below and see the Ohio State Nike LeBron Soldier 11 Cleats in action on Saturday at 7:30 PM EST. 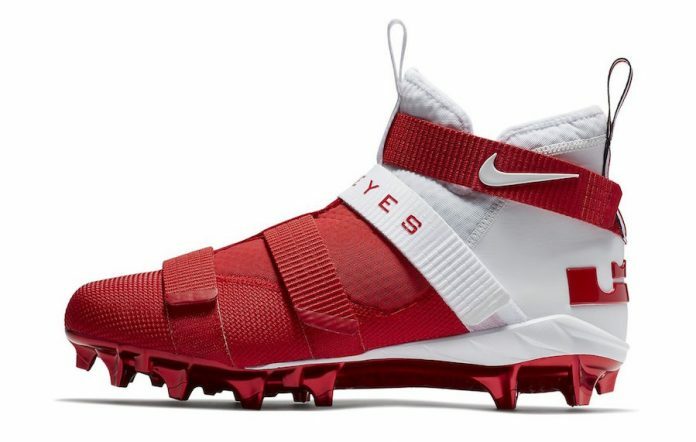 UPDATE: You can now buy the “Ohio State” Nike LeBron Soldier 11 Cleats via Nike.com.